Your iPad 2 is so close, you can almost hear the click of your new Smart Cover snapping into place. But if you already own the original iPad, you should take time now to prepare your migration from that device to the iPad 2. With advanced planning, you’ll be ready to start playing with your new tablet practically from the moment you open up the box. Take your trusty, first-generation iPad and plug it into your computer. If iTunes doesn’t launch and start syncing automatically, initiate a manual backup: right-click on the iPad in iTunes and choose Back Up from the contextual menu. Your backup will save your iPad’s settings and saved data, but it doesn’t actually back up your installed applications, music, movies, or photos. That’s because iTunes and iPhoto take care of keeping that data separately. Wait impatiently for your iPad 2, either in line, or for a delivery person to show up at your door. After you’ve taken the time to caress the comely edges of your new iPad 2, bust out the sync cable again and connect the new one to your Mac. iTunes will present a window headlined Set Up Your iPad. 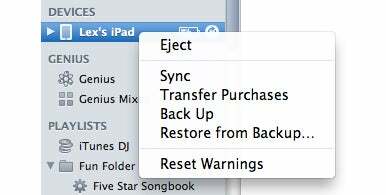 You can choose to “Restore from the backup of…” the iPad you backed up in Step 1. When you do that, iTunes actually makes a copy of the backup, stamped with the current date and time, and uses the copy to load up your new iPad. Once you’ve successfully restored the new iPad from your old backup, it will restart. When iTunes rediscovers the iPad (after the restart completes), the software will begin syncing your music, movies, and photos to the iPad, depending upon your sync settings.